Our tasting room is open May to October, Wednesday to Sunday, 12pm-6pm. 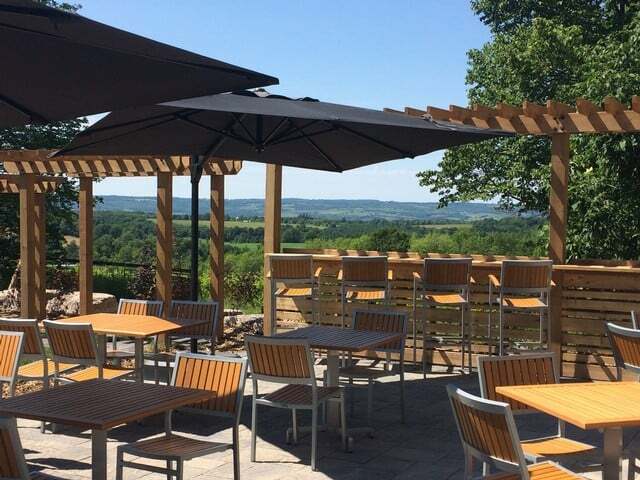 We welcome you to take a stroll through the vineyard, have a seat on the patio, or grab a picnic blanket and relax on the lawn with one of our charcuterie plates. We're a family-run winery and children are very welcome. We offer free winery tours every day we're open at 12:30pm. Meet at the tasting room and a friendly member of our staff will lead you on a journey through the vineyard and production cellar. It's a great opportunity to learn about grape growing and winemaking at The Roost and visit behind the scenes. Please note during the harvest season the tour itinerary may be altered due to cellar operations. Taste three of our wines, with the fee happily waived if you purchase 2 bottles of wine. Try out our line-up and chat with our knowledgeable staff about cold-climate grapes and winemaking at The Roost. Our wines are a mix of estate grown and select Niagara blends. Each one is unique and we’re pretty sure you’ll find one you love. Can't decide what to have? Want to sample at your own pace on the patio? Take a flight of 4 wines to your table. Each serving is 1.25 oz and the four glasses are served a specially designed 'flight paddle'. Please note that wine flights are considered equivalent to a glass serving and we are not able to waive the fee on the purchase of bottles as we do with tastings (see above). Maybe you’ve visited us before and you know what you like, or you just want to sit down and relax. Either way, most of our wines are available by the glass. Feel free to settle into a sofa, have a seat on the patio, or borrow some glass holders and a blanket and head out to the lawn. Our cheese and charcuterie plate is an ever-changing celebration of wine friendly nibbles. We try to source local products as much as possible and love bringing new finds to your plate. Our plates are designed to be a meal for one, or an excellent share plate for two. Bernard Mueller at Christy's Gourmet Gifts is a Master Chocolatier who specializes in bean-to-bar chocolate and fine, handmade confectionary. We are very pleased to offer Christy's chocolates and sweets as part of our chocolate tasting board, which is specially selected to pair with our wines. If you haven't had chocolate and wine together, you're in for a very special treat!